As you plan your trip to Philadelphia this May for the NAFSA 2018 Annual Conference & Expo, consider some of these tips on both the journey and the destination to explore all that the city has to offer! 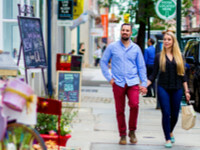 Philadelphia is a generally walkable city, and with NAFSA 2018 being held in Center City, where there are many attractions within walking distance, leaving the downtown area may seem unnecessary. But with an abundance of neighborhoods, museums, and restaurants to explore knowing how to get around is a must! With only 25 blocks in-between two rivers, the Delaware and the Schuylkill, Philadelphia is a narrow city making it a pedestrian and biker’s paradise. Thus, there are many walkable paths and guided historical routes to follow, as well as bike share options and designated bike lanes. View a detailed list with even more transportation options. PHL is a mid-sized airport with countless amenities and is located only a short 10-15 minute car ride from Center City. On the drive, enjoy great views of the Philadelphia skyline, the city’s professional sports stadiums, and mostly likely a mural or two! International arrivals and departures can be found at terminal A and all other gates at terminals B-F. One of the best things about PHL is that there are no tram rides or extensive connectors between terminals so you can enjoy a bit to eat in terminal C and then catch your flight in terminal F.
From the airport, you can take a ride-share service, taxi, or the SEPTA regional rail line to Center City. If you are traveling from Washington D.C., New York, or Boston, you may consider taking an Amtrak train, and the 30th Street Station will be your stop! This breathtaking Art Deco building houses Amtrak trains, with the option to transfer to SEPTA regional rails. The 30th Street Station is outside of Center City so if you are staying near the Convention Center you will have to use a second mode of transportation like the regional rail or a ride-share. View a detailed guide. With so many convenient and accessible transportation options coupled with attractions to match every visitor’s interest, planning some extra days in Philly around #NAFSA2018 is a must! Hailey Gouza is the university relations coordinator and marketing assistant for the Mid-Atlantic region at Barcelona Study Abroad Experience (Barcelona SAE) and Local Arrangements Team (LAT) communications chair for the NAFSA 2018 Annual Conference & Expo.